I was at a friends shop recently welding aluminum... some 3" x 1/8" wall square tubing...and was using a 200 amp tig welder. Some comments came in on my youtube channel asking why we didnt just MIG weld all of it using a spool gun. So I thought it might be interesting to compare Welding aluminum with a spool gun to TIG. Maybe we can answer some questions and all learn something in the process. I have MIG welded aluminum without a spool gun but found that the results just were not worth the aggravation. I worked at a sheet metal fab shop a long time ago and they had an old Linde mig welder set up with a teflon liner and a special weak tensioner spring for aluminum wire. If you leaned the gun back to let an inch or so of wire to feed before starting the arc, sometimes you could get a decent bead with a burnback. But most of the time, I would go thru a few tips on the simplest job. I hated it that thing. A spool gun setup works much better. I even have a very nice push pull setup on my Lincoln Power Mig 350mp that has special settings like run-in and crater fill. But for todays video, I am using a small economical spool gun setup on the smaller 210mp. 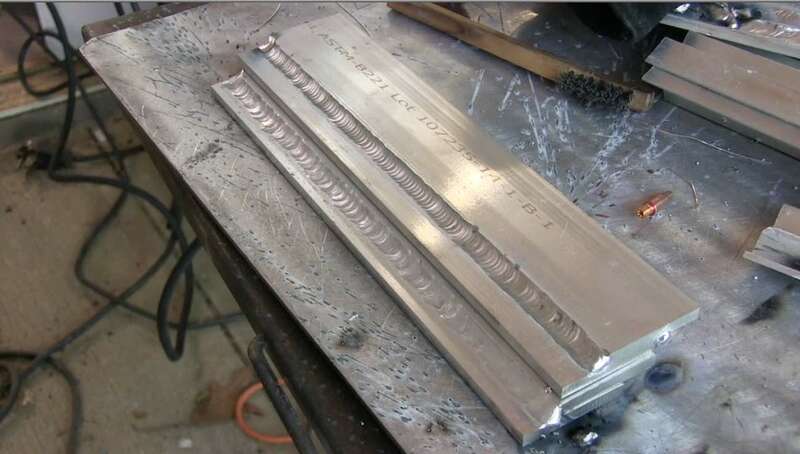 Everything seems to make more of a difference when you mig weld aluminum. Stickout, gun angle, gas flow...all seem to make more of a difference on aluminum than on steel. You will have burnbacks and so you need to have new contact tips on hand. With steel, gun angle matters but not nearly as much as it does when you are welding aluminum. So try to always use a push angle. A pull angle will cause soot. not the end of the world, but you can avoid soot if you push and have good gas coverage. keep a small stainless brush handy for the soot. Maybe it goes without saying but use pure argon or an argon/helium mix...dont even try using the same C25 you use for steel. Aluminum wire is soft. that is why spool guns were invented. so use the largest diameter wire that runs good for the application. Rule of thumb is 1/8" (3.2mm) and thicker for a spool gun. anything thinner requires finesse. a 3/4" stick out is about right for a spool gun. experiment. MIG is usually faster but is not always a lot faster. For the 1/4" (6mm) lap joint shown in the video the Mig joint took 45 seconds...The TIG weld took 60 seconds. I prefer to TIG whenever I can, but there are times when Mig with a spool gun is the way to go. In the part video of the Aluminum Awning Project, you will see JD hanging the awning in place at the job site and running his Power Mig 210mp using a generator.